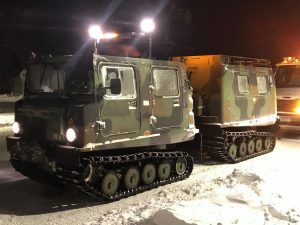 The National Guard unit based in Olivia used these SUSV vehicles to rescue motorists stranded near Olivia Thursday evening. Renville County National Guard and law enforcement units were kept busy by the blizzard Thursday evening, rescuing stranded motorists and dealing with multiple collisions on icy roads. On Thursday, Renville County was in the path of a large winter storm, with significant winds, blizzard conditions, and several hours of zero or near-zero visibility for motorists. At 3:32 p.m., a two-vehicle crash was reported on Highway 4, about 4 miles north of Hector. A 2014 Mazda 3, driven by Michael S. Hoium, age 31 of Rochester, became stuck in a snow drift on a bridge. Hoium’s vehicle was rear-ended by a large pick-up, which then left the scene. Hoium was examined at the scene by the Hector Ambulance Service. He had only minor injuries and was not transported to a hospital. His vehicle was a total loss. The crash investigation is continuing, including identifying and locating the second vehicle involved. Weather conditions at the time included snow and blowing snow with at or near zero-visibility in the area. At 3:54 p.m., a three-vehicle, minor crash with no injuries was reported on Highway 71, about 1half a mile north of Highway 212. Similarly, the crash was caused by at or near zero visibility due to blowing snow. The vehicles sustained minor to moderate damage. After dark, travel became even more difficult on highways and county roads across all of Renville County. Zero visibility, combined with drifts forming on roads, made travel often impossible. Throughout the evening and into the early morning hours of Friday, Renville County Sheriff’s Office dispatchers took multiple reports of vehicles off of the roadway or stuck in drifts on the roadway, most of which had their occupants stranded within. Sub-zero temperatures and wind chills in the -20 to -30 degrees made these situations extremely dangerous. Officers from the Renville County Sheriff’s Office and several police departments in Renville County spent several hours attempting to reach the stranded motorists and bringing them to safety. With local shelter resources in the Olivia area used up, Gov. Tim Walz declared a peacetime state of emergency and ordered the National Guard Unit in Olivia to provide assistance in rescuing stranded motorists with their specialized vehicle and equipment, and to provide emergency relief services by opening and staffing the Olivia armory as a shelter for stranded motorists. When Highway 71 north of Olivia became completely impassable by conventional vehicles, the National Guard Unit conducted two separate rescue missions during the night with their SUSV Tracked Vehicle. Eight people were rescued from vehicles on Highway 71 by the SUSV team and were brought to safety at the armory. The armory provided overnight emergency shelter for 18 stranded motorists in the area. One stranded motorist suffered an ankle injury while attempting to walk away from his stranded vehicle in a snow-filled ditch.